Movement Makers “Learn, Connect, Do” is set to be a recurring event after its successful debut at Glasgow Caledonian University on Tuesday. The inaugural Movement Makers enabled over 100 people to explore models, motivations, and aspirations for social innovation. Organised by The Melting Pot, Scotland’s centre for social innovation, the event was hosted by Glasgow Caledonian University. Josh Littlejohn, co-founder of Social Bite, featured as keynote speaker. This was followed by breakout sessions and a panel consisting of academics and practitioners from the social, environmental, and health and wellbeing sectors. This broad intersection of representation, united around similar values and concerns, positioned Movement Makers as a platform to discuss challenges and solutions for Scotland’s most pressing problems. Littlejohn hoped attendees of Movement Makers were inspired from the day, and would direct that energy into their own journeys. 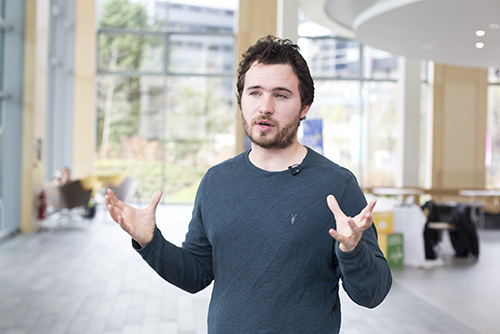 With connections and relationships at the forefront, Movement Makers was another step in solidifying the relationship between The Melting Pot and Glasgow Caledonian University. The Melting Pot is also key partner on Glasgow Caledonian University’s SIKE Project (Social Innovation through Knowledge Exchange). The Melting Pot, based in Edinburgh, is Scotland’s Centre for Social Innovation. The community exists to stimulate and support social innovation by providing a range of practical resources, knowledge, support, and networks to diverse enterprises aiming to generate social impact across Scotland. Led by event coordinator Julie Ellam and a team of volunteers, Movement Makers was designed to fit in to The Melting Pot’s calendar to inspire innovative conversations and ideas. Nick Murray, Marketing Lead for ‘Adopt an Intern’, came to Movement Makers to learn about what social enterprises were doing in other sectors. By drawing attention to the intersections between diverse issues in Scotland, discussions at Movement Makers quickly inspired innovative problem solving. To those who attended: now you are a Movement Maker, don’t let the momentum slow down! Link up with your new connections, and continue conversations over coffee or at the pub. A change in location may spur new ideas or inspire a novel approach to an old problem. Did Movement Makers inspire the next big idea in you and you don’t know what to do with it? Since 2011, The Melting Pot has been running Good Ideas Academy, an incubator that inspires and supports people to turn their great ideas into new social enterprises, charities, and campaigns. If you’re interested, check out the upcoming events here. Mark Anderson summed up the ethos behind Movement Makers perfectly: “the only way social innovation can grow is to keep connecting, keep learning, and keep doing.” If you are interested in hearing about TMP’s upcoming events, check out The Melting Pot’s events calendar. You can also subscribe to our newsletter. Thank you again to all those who attended. It was exciting to see people coming together to learn, connect, and make things happen: see you next time! Keep talking, keep exploring, keep curious. Follow us on social! We are on Facebook, Twitter, Instagram, and LinkedIn. The Melting Pot is Scotland’s Centre for Social Innovation and key partner on the SIKE Project (Social Innovation through Knowledge Exchange), an EU Erasmus+ project coordinated by Glasgow Caledonian University. The Melting Pot stimulates and supports social innovation by providing a range of practical resources, knowledge, support and networks to diverse enterprises aiming to generate social impact across Scotland. We wouldn’t have been able to put on this event with collaborating with some fantastic people. Thank you all!